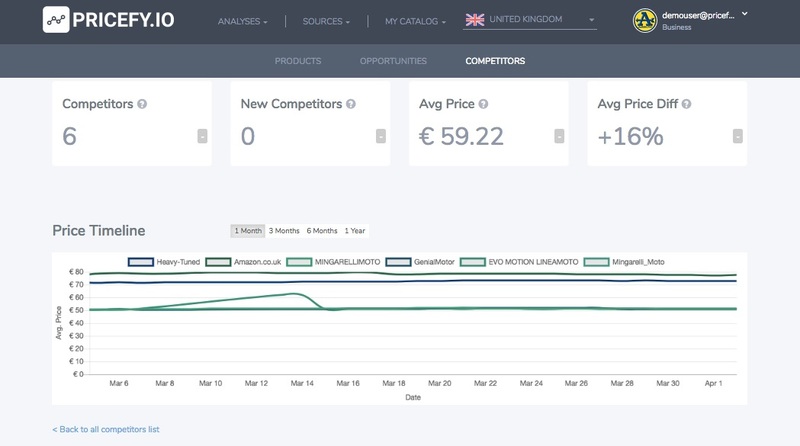 How to check your competitor products' prices over time. The new price timeline will help you to be competitive in every moment. If you want to be competitive, is really important that your customers know you are in every moment. Is not be a case that you are lower than your competitors and on the long distance this will do the difference. But how to have always under control your competitors' prices? And how to easily understand your price positioning on the market? Since the 1.3 version, PRICEFY introduce the Price Timeline. A chart that helps you easily understand your price positioning among your competitors and that helps you monitor their price strategy over time. Clicking on the chart icon, on the side of each competitor, you can add or remove his price history from the chart.